#8 x 1-1/2" Coarse Washer-Head Screws, 500 pc. Kreg SML-C150-500 - #8 x 1-1/2" Coarse Washer-Head Screws, 500 pc. 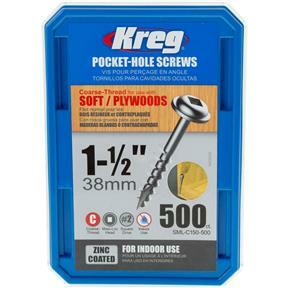 Kreg 1-1/2" #8 Coarse Washer-Head Pocket Hole Screws work well in 1-1/8" thick material. 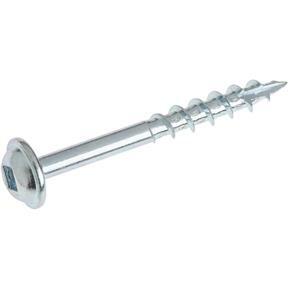 The washer head of this screw is a very popular head style, as the wide bearing surface of the head will not overdrive in the bottom of the pocket. This is especially important in softer material such as plywoods and composites. The screw also features a type 17 auger tip that self-taps its own hole, eliminating the need to predrill in even the hardest materials. Kreg screws also have larger diameter steel shanks than many other screws on the market today making for an impressively strong screw that is almost impossible to break. These screws have a dry-lubricant coating that eases driving torque and provides greater rust resistance.